Believe it or not, office furniture sales take place at specific times of the year, just like seasonal clothing and electronics. Even better, those sales times are pegged to specific annual happenings. If your company is getting ready to move out old office furniture before having new furniture delivered, take advantage of the seasonal sales so you can save money. It makes sense, when you think about it. Your tax preparer filed your business taxes on or before April 15th. You know what your financial health is and you have a good idea of how much you can spend on new office furniture. This is one of the two best times of the year to begin visiting office furniture stores and websites to see what you can find. Make notes of what is available and where you found it. Keep track of the markdowns and compare the new prices of furniture to the original prices. Your overall goal is to save money, and by figuring out how much markdowns will save you lets you make a stronger presentation to the company’s owner. Even if the office furniture you need happens to be workstations, you should be able to find good prices on what you’re looking for. In August and September, not only do schoolchildren return to school, businesses buy new office furniture. This is a natural tie-in. Stores, including office supply stores and office furniture stores, time specials and sales for the end of the third quarter and the beginning of school. Schools, colleges, and universities are opening, which means students need school supplies. College students, whether they are moving into dorms or apartments, need desks and bookcases so they can store textbooks, school supplies and get their studying done. Along with the families of these students, you and a few of your managers should visit furniture stores and office supply stores, where you’ll find that the office furniture in stock has had its prices discounted. If the furniture is already on clearance, you’ll be able to benefit from even deeper discounts. 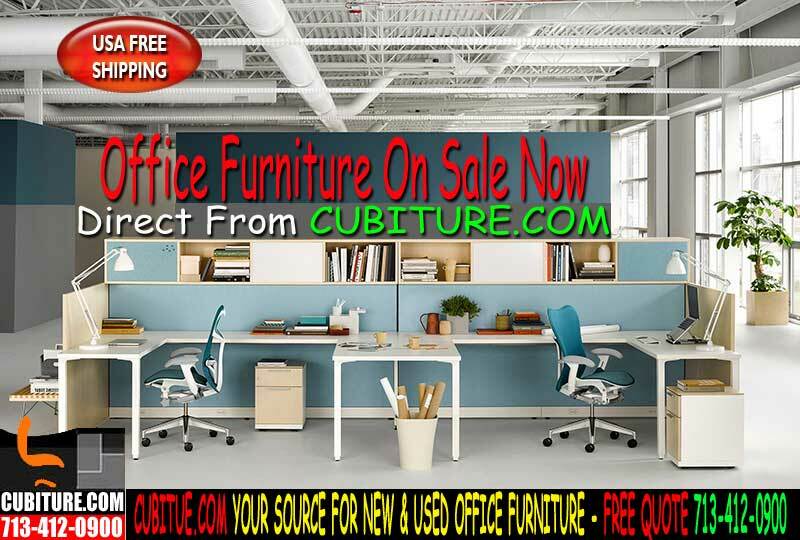 Call us at Cubiture.com 713-412-0900 to ask about our stock of office furniture and any applicable sales prices we’re running. By using these two options, you’re going to be looking for used and possibly, refurbished office furniture. Companies go out of business throughout the year, so you’ll need to stay connected to your sources and to business publications year-round. When you learn about a company that is moving or going out of business, call them. Let them know that you’re interested in seeing their furniture. They may be able to give you the furniture for free, so that means you’ll be able to spend reserved funds for refurbishing what you find. Estate sales are another excellent source of used furniture. You may find some high-end pieces here. Sign up for email alerts in your community – people who need to sell their furniture contact estate sales companies to help them organize their estate sale. Here, you will have to buy the furniture you find. In addition, you’re not likely to find many pieces at one time. Browse our office furniture and buy during one of our sales.